Make 4 payments of $130.00 over 8 weeks and get it now! 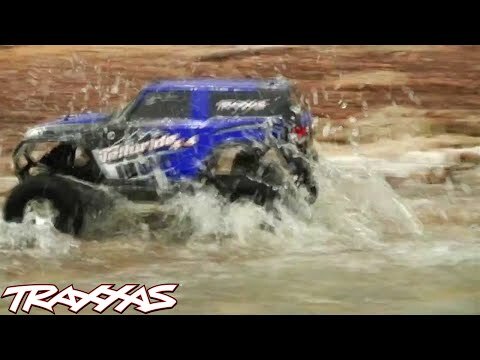 1/10 Scale Extreme Terrain 4X4 Trail Rig! Telluride: A great town in the Rocky Mountains that symbolizes rugged adventure, extreme terrain, and outdoor fun. The Traxxas Telluride 4X4 captures that spirit in a new off-road adventure vehicle that is engineered to go to places in the farthest reaches of your imagination. Pack it in your RV, load it in your Jeep®, take it on the trails. 4-wheel drive traction, specially tuned differentials, and long-arm suspension give it sure-footed rock crawling prowess. Off the rocks, the XL-5 ESC and Titan 550 motor dish out high-speed driving excitement. It's all waterproof, so the fun keeps going through water crossings, mud, and even new mountain snow. The Telluride 4X4 is fully assembled, painted, and Ready-to-Drive® with included 7-cell 8.4V NiMH battery pack and charger. The Traxxas Telluride 4X4 is built on the proven performance of the advanced shaft-driven 4WD system and innovative modular design of the award-winning Slash 4X4. The chassis fully integrates the electronics and battery compartment for an efficient and compact layout, and maintains the high center ground clearance that gives the Telluride 4X4 its high-riding look. The extra clearance drastically increases the off-road versatility allowing you to tackle extreme terrain and bigger obstacles. The Telluride 4X4 uses just three gear meshes to drive all four wheels, eliminating the need for a multi-gear transmission. The highly efficient drivetrain spins effortlessly on rubber-sealed ball bearings, and is integrated seamlessly into the unique chassis for optimum performance and easy maintenance. There are no dogbones to wear, no drive cups to wobble. A single center driveshaft connects the front and rear drive assemblies for maximum power transfer. The shaft runs perfectly straight and true and offers superior durability. A clear cover shows off the center driveshaft while keeping dirt and debris away from the shaft. Telluride 4X4 is equipped with the new TQ 2.4GHz radio system. The TQ's modern design features an internal antenna for a sleek look, and an ergonomic grip for all-day driving comfort. 2.4GHz technology means there's no need to worry about frequency conflicts, no matter how many other drivers you're racing with. Just switch on and drive -- the TQ automatically locates and locks onto an open frequency.